← The Year of the Pig has begun ! Eating a mango is a little bit like dealing with life … it can get a bit messy but it can also be mighty tasty. 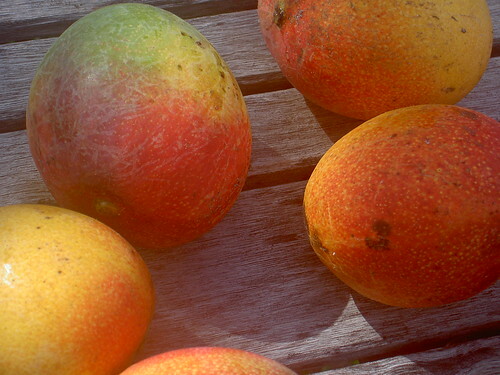 Cut the Mango in half with a sharp knife – one half will have the pit. You have two choices on what to do next, as in life, there is always at least two choices. Take the half with OUT the pit and gently turn the skin inside out. This allows you to pull the juicy fruit away from the skin. There is always a little bit of meat left on the skin, so you will want to take your fingers and slide them over the peel and get the juice and the flesh off. It is good to do this over a bowl so the clean up is easier but also so you will be able to use all of the juice that comes from the Mango. Take the other half, the one with the PIT and do the same thing, turn it inside out and peel the juicy fruit off of the skin. There is a lot of more fruit on this half. Take the pit in your hand and just squeeze it over the bowl. Fruit will go in between your fingers and it can be quite messy. However, it also feels very good if the Mango is warm. After cutting the Mango in half, take the knife and slice the skin off of the fruit as if you were cutting a potato or apple. The half with the pit, you will cut the mango off in large chunks, carefully slicing close to the pit. After the Mango has been sliced, you can eat it plain, add it to pancakes, make soup and share it with someone you care about. Your fingers (& possibly other parts of your body) will get a little sticky in the process however, this is what happens with MANGOES … as in life. It’s about accepting the Messy part of LIFE because if you can get pass the sticky part, what you are left with can be very delicious.